General Electric has closed its last major factory making incandescent light bulbs in the United States, a victim of a 2007 law banning sale of the light bulbs by 2014. Environmental activist groups promised the restrictions would create green jobs, but workers at GE’s Winchester, Virginia plant are finding the law is merely creating red jobs overseas in China. The 2007 law imposed energy efficiency requirements that cannot be met by traditional incandescent light bulbs. Compact fluorescent lights (CFLs), which are much more expensive than incandescent light bulbs, are the least expensive alternative. The manufacture of CFLs, however, is labor-intensive and too expensive to be done at U.S. wage rates. GE could retrofit its Winchester plant to produce CFLs, but GE CFLs would be 50 percent more expensive than bulbs made in China with the benefit of cheap labor. Realizing it could not compete with such a cost disadvantage, GE is closing down its Winchester factory. Two hundred workers at the Winchester plant are being put out to pasture during the worst economic conditions since the Great Depression. Many others preceded them while CFLs gained increasing market share under the looming incandescent light bulb ban. H. Sterling Burnett, a senior fellow at the National Center for Policy Analysis, says people should not be surprised by job losses caused by environmental mandates such as the ban on incandescent light bulbs. Doubling down on the job-killing green mandates contained in the 2007 energy bill, “The Obama administration has repeatedly thrown billions of dollars in subsidies to ‘green technologies’ that can’t compete in the marketplace, are higher priced and thus aren’t chosen by most consumers when they vote with their pocketbooks, don’t function as well, and are manufactured overseas,” said Burnett. Sam Kazman, general counsel for the Competitive Enterprise Institute, pointed out banning incandescent light bulbs does not necessarily bring environmental benefits. In 1987 the town of Traer, Iowa handed out 18,000 free fluorescent bulbs to its residents in a demonstration project aimed at reducing power consumption, Kazman noted. Residential electricity use actually rose by 8 percent, because people used more lights and kept them on longer, once they realized their lighting was cheaper. “This is yet another demonstration that technologies that utilize energy more efficiently often result in more energy use rather than less, because the energy becomes more useful. When these technologies are developed in a free market, everyone gains. But when they’re forced on people by legal mandate, then the outcomes are somewhat different,” Kazman said. “If the new energy-saving technologies being pushed by government are really that good, then we don’t need government to mandate them. And if they are being mandated, that’s a sure sign that they’re not very good,” Kazman observed. Kenneth Artz (iamkenartz) writes from Dallas, Texas. The Conservator of Art, at a major Midwestern University, recently pointed out that museums should not be using CFLs as the UV is damaging to the works of art. This being understood, why would anyone ignore the fact that the UV emitted by CFL bulbs would also be damaging to the eyes of humans and household pets, as UV-blocker glasses are not usually worn in our homes or offices? What about the effects of UV upon fabrics of carpets, rugs, draperies, and home furnishings? Where is the EPA whose job it is to protect us? Yes, some jobs will be created, thanks to the ban. Unfortunately, those jobs won’t be here in the U.S. — they’ll be in China, where CFLs can be made cheaper. This whole affair is a prime example of bad “unintended consequences” resulting from well-intentioned plans — plans imposed by devotees of big-government solutions for nearly every problem. The word about CFLs is finally getting out. There should be an enquiry about how governments around the world allowed the lighting industry to get them to insist their citizens use only CFL (since LEDs are still too expensive) light bulbs. Governments didn’t do their homework on these lights. They should be banned rather than promoted. The same EPA which tells us how great CFLs are is now telling us how horrible the cleanup is when you break one. Owners of places of public accommodation, may want to read this very carefully. What liability can you incur if your place, your patrons, or your food supply becomes contaminated? From an insurance standpoint, this sounds like a potential nightmare for a restaurant, motel, hospital, extended care facility, retail establishment, and other places of public accommodation. Based upon the data in that document, the very first step is to “Have people and pets leave the room, and don’t let anyone walk through the breakage area on the way out”. Then it goes on “Open a window and leave the room for 15 minutes or more”. The food supply of a restaurant would likely be contaminated and the clothing of any patrons could be the subject of a claim, based upon the procedure set forth in the bottom section of the first page. Perhaps insurance underwriters may wish to review their policies to determine the extent to which they want to cover such liability as it applies to business interruption as well as the consequential damages. With the local hardware stores, Wal-Mart, Lowe’s, and Home Depot selling them like popcorn and the State and Federal government subsidizing the sale of them, this risk exposure is going to get significantly worse before it gets better. And it won’t get better until the manufacturers offer LED bulbs instead of the CFLs. Perhaps you may wish to take a look at the “EPA Instructions on Cleanup” post to understand the magnitude of the implications in that procedure. Who is going to reimburse your clients for the new clothing which they might need to replace that which is discarded in compliance with the EPA instructions? Who is going to pay to decontaminate (replace) your food and office supplies? Are these acceptable risks for your business to take? These all add into the true cost of using CFLs, plus you still have to deal with the multiplicity of deleterious effects to one’s health and well-being. What is the government doing now? The idiots in Washington are spending more of our money promoting CFLs, which take away my ability to function. They started a web site fatherhood.gov, which tells you to take your kids on a “green” shopping trip and buy CFLs. And another, loseyourexcuse.gov, also promoting CFLs, without the facts of the serious medical consequences which so many people face. As you read this, it not only thanks the Tecumseh Public Schools for their awareness of this issue, but it also cautions merchants about the risk of having a Hazardous Waste cleanup problem should a CFL be broken as well as the potential for further injury to folks who have had Acquired Brain Injury. Dr. Havas’ research has established that the mercury contained in one CFL bulb can contaminate 190,000 litres (>50,000 U.S. gallons) of water beyond the level considered safe for drinking. Imagine what it would do to the food supply of a restaurant. Should the restaurant be evacuated so that the patrons do not get a dose of this toxic material? Also, since Acquired Brain Injury is associated with medical issues with CFLs, it would be reasonable to expect that returning heroes, with IED injuries, may well experience these problems, but have yet to associate the cause and effect. The indiscriminate use of CFLs could pose a serious liability issue for merchants who choose to use CFLs, particularly since the alternative is available in the form of LED lights, which do not have the deleterious effects. This advertisement is at best a uninformed statement and at the worst, criminal. unintended consequences of their actions and the cataclysmic results thereof. website which you put together for the U.S. Government? and Facial Flushing as well as other issues? 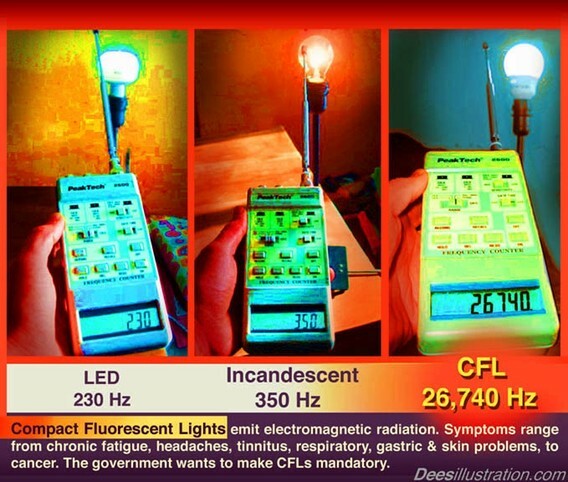 spurious emissions from CFLs and lighting choices including LED bulbs? 4. Have you checked out the more efficient alternatives to CFLs? 5. Do you know how to safely dispose of CFL? people but also to the credibility of the Ad Council. scientists from multiple disciplines and several countries. to be used by all and promoted with taxpayer dollars. billboards to give equal exposure to the medical facts presented in the website cflimpact.com.